Our Toy Soldiers group costumes were inspired in part by the Disney animated movie, Toy Story. These costumes were fun to make. At first, we were like, “this would be a cool idea” but as we got closer to finishing them including props and all, it became apparent that this was a great idea. We got the army jackets from an army surplus store online (yeah, these were real army jackets; really legit). We got the cargo pants from a local thrift store and the boots as well. The helmets, masks, gloves and guns were purchased from a Halloween store. Pretty much any Halloween store will have these. The bazooka and minesweeper were made from PVC pipes purchased form a local hardware store and then pieced together with glue, nails, etc. We painted the army jackets and cargo pants. We used spray paint on the accessories and boots. We didn’t spray paint the jacket and pants because it would take way too many cans of spray paint to complete the look. We actually did start with spray paint on the jackets and pants but it just soaked through. It would require you to spray on at least 4 layers for the color to stay. So we bought a gallon of the green paint and just rolled it on instead. Two coats per jacket and pants were good enough. And it saved us a lot of money. 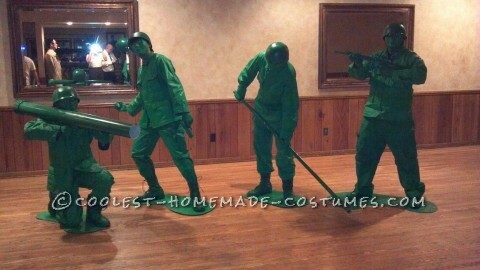 The spray paint worked great for the helmet, guns, boots and PVC pipes; two coats as well. The masks and gloves were already green when we purchased them which matched exactly to our paint scheme. We wanted the plastic look and wanted our faces to look the same and that’s why we went with the masks. I think it gives it a legit look. We used some facial paint for the exposed skin areas, mainly our necks and ears. I think though, that the final piece which tied everything together were the cardboard cut outs that we used as the platforms. These were also spray painted to match our color scheme. Without these, the costume would not have looked so good. All in all, it was fun experience and something that was simple to put together and looks great. It took about a week to paint everything and let it all dry. The clothes were stiff at first but after wearing them for an hour or so, they felt fine. We spent about $60 each. OMG! i am so impressed.